Fallah Nezhad, M., Abbasi, M., Shahin, E. (2017). A multi-objective optimization model for process targeting. 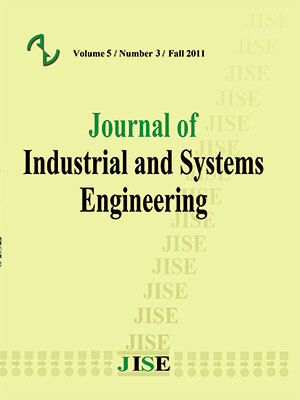 Journal of Industrial and Systems Engineering, 10(Issue 1), 18-34. Mohammad Saber Fallah Nezhad; Mehdi Abbasi; Ehsan Shahin. "A multi-objective optimization model for process targeting". Journal of Industrial and Systems Engineering, 10, Issue 1, 2017, 18-34. Fallah Nezhad, M., Abbasi, M., Shahin, E. (2017). 'A multi-objective optimization model for process targeting', Journal of Industrial and Systems Engineering, 10(Issue 1), pp. 18-34. Fallah Nezhad, M., Abbasi, M., Shahin, E. A multi-objective optimization model for process targeting. Journal of Industrial and Systems Engineering, 2017; 10(Issue 1): 18-34. Customers and consumers are the necessities for the survival of industries and organizations. Trying to improve the process in order to increase consumer satisfaction is the most important aim. The survival of an organization depends on its ability to continue the activities in compliance with the demands of customers to meet their legitimate needs. An organization is successful when it exactly knows these needs and provides the right products. The selection of the optimal process target is an important problem in production planning and quality control. For complex manufacturing systems, process or product optimization can be instrumental in achieving a significant economic advantage. To reduce costs associated with product non-conformance or excessive waste, engineers often identify the most critical quality characteristics and then use methods to obtain their ideal parameter settings. The purpose of this study is to find the optimum targeting value. a product with two quality characteristics with independent distributions is considered. To determine the market of product sales, random sample size of lot size selected. based on the quality of products, the lot placed in primary market, secondary market, reworked and scraped. To obtain the optimum targeting value, use NSGA II algorithm with Maximize expected profit and minimize expected loss. Chen, C.-H. and M.-T. Lai, Economic manufacturing quantity, optimum process mean, and economic specification limits setting under the rectifying inspection plan. European Journal of Operational Research, 2007. 183(1): p. 336-344. Chen, C.-H. and H.-S. Kao, The determination of optimum process mean and screening limits based on quality loss function. Expert Systems with Applications, 2009. 36(3): p. 7332-7335. Darwish, M., F. Abdulmalek, and M. Alkhedher, Optimal selection of process mean for a stochastic inventory model. European Journal of Operational Research, 2013. 226(3): p. 481-490. Das, C., Selection and evaluation of most profitable process targets for the control of canning quality. Computers & industrial engineering, 1995. 28(2): p. 259-266. Deep, K. and M. Thakur, A new mutation operator for real coded genetic algorithms. Applied mathematics and Computation, 2007. 193(1): p. 211-230. Duffuaa, S.O. and A. El-Ga’aly, A multi-objective optimization model for process targeting using sampling plans. Computers & Industrial Engineering, 2013. 64(1): p. 309-317. Ebrahimizade, A. The problem of locating the hub maximum coverage under uncertainty. Master thesis of yazd University , [Persian] 2013. Fallah Nezhad M.S., Niaki S.T.A. and Shahin E, A Markov Model to Determine Optimal Equipment Adjustment in Multi-stage Production Systems Considering Variable Cost. Iranian Journal of Operations Research, 2013. 4(2): pp. 146-160. Fallah Nezhad M.S. and Ahmadi E, Optimal Process Adjustment with Considering Variable Costs for Uni-variate and Multi-variate Production Process. International Journal of Engineering, 2014. 27(4): p. 561-572. Goethals, P.L. and B. Cho, The optimal process mean problem: Integrating predictability and profitability into an experimental factor space. Computers & Industrial Engineering, 2012. 62(4): p. 851-869. Gong, W., Cai, Z., Ling, C. X., & Li, H. (2010). A real-coded biogeography-based optimization with mutation. Applied Mathematics and Computation, 216(9), 2749-2758. Hunter, W. G., & Kartha, C. P. (1977). Determining the most profitable target value for a production process. Journal of Quality Technology, 9(4), 176-181. Ishikawa, K. (1986). Guide to quality control. Quality Resources. Juran, J., & Godfrey, A. B. (1999). Quality handbook. Republished McGraw-Hill. Lee, M.K., et al., Determination of the optimum target value for a production process with multiple products. International Journal of Production Economics, 2007. 107(1): p. 173-178. Noorossana. R. Statistical Quality Control. Iran University of Science and Technology. Third Edition, [Persian],2006. Park, T., Kwon, H. M., Hong, S. H., & Lee, M. K. (2011). The optimum common process mean and screening limits for a production process with multiple products. Computers & Industrial Engineering, 60(1), 158-163. Pulak, M. and K. Al-Sultan, "The optimum targeting for a single filling operation with rectifying inspection". Omega, 1996. 24(6): p. 727-733. Sadeghie, A. Decision-making based on genetic algorithm optimization. New Science Publications, [Persian] ,2006. Shao, Y.E., J.W. Fowler, and G.C. Runger, Determining the optimal target for a process with multiple markets and variable holding costs. International Journal of Production Economics, 2000. 65(3): p. 229-242. Springer, C. H. (1951). A method for determining the most economic position of a process mean. Industrial Quality Control, 8(1), 36-39. Srinivas, N. and K. Deb, Muiltiobjective optimization using nondominated sorting in genetic algorithms. Evolutionary computation, 1994. 2(3): p. 221-248. Tareghian H. R., Bozorgnia A., the application of the quality control systems using the statistical methods. Publishers of Ferdowsi Mashhad University,[Persian] 1998 .219.